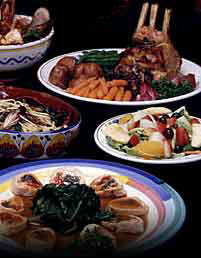 Only Catering offers a large selection of menu items to fit any occasion. Our Deluxe Menu features items perfect for your special events. Our Delicious Party Trays and Side Dishes will complete your catered party experience. We also have a list of cost-conscious Buffet Menus perfect for all occasions. Don't find a menu that suits your special needs? Call us today and speak to one of our Event Planners. We can customize your special event. Let us do the work for you.